I just drove from Boston to Binghamton, N.Y., my hometown. The drive is long (depending on the traffic and number of stops, for which I’m notorious, it can take up to 6.5 hours), and can be tedious (in the winter – imagine seven hours of driving in the dark, your headlights illuminating the snow blowing at you in a way that makes you feel like you’re in some kind of warp-speed tunnel), but this time of year it is usually beautiful. The leaves, which are just starting to turn, can make all the difference. Well the leaves plus some sun. It’s rarely sunny in Binghamton so if the sun is shining, things look much better. Anyway, I missed the peak leaves by about a week, but it was still one of the better drives I’ve made to town. If you’re into tracking the changing of the leaves, Away.com has a fall foliage guide that will help. I had dinner with my friend Cara tonight, and she mentioned that she occasionally visits the Yahoo international page and looks at the news sections from around the world to see what the top stories are in other countries compared to the top story in the U.S. She does it, she says, because it is interesting to see what other countries do and don’t care about vs. what we read about in the United States. It seemed like it would be an interesting thing to look at, plus, since many of the sites are in foreign languages, it was also a good way to use the Babelfish translation service (I’ve been curious to see how good a job it does). So here are the top news stories in 10 countries (plus the U.S.). All translations were done using Babelfish. Melissa’s Translation: I have absolutely no idea what this means, but there was a picture of a car with the heading “Green Center” next to this headline if that helps at all. Korea: ??? ????? ?? “6??? ??? ???? ??? Melissa’s Translation: Again, I have no idea what this means except possibly that Babelfish doesn’t do such a good job with translations of Korean to English? Russia: ????? ?? ????? ??????????? When I originally copied and pasted into the system that publishes my blog (WordPress) the Chinese, Korean and Russian characters displayed properly. But when I tried to save, they changed to question marks…I left it that way here on purpose to illustrate just how far we still need to go with international compatibility. In 2006, the fastest growing Internet audience was in…India, where the growth rate was 33%. India’s growth was followed by the Russian Federation (21%), China (20%), Mexico (18%), Brazil (16%), Italy (13%) and Canada (11%), according to a report from comScore. The growth rate in the U.S. was a mere 2%. The largest Internet population in the world is still in the United States. The same comScore report showed that even though the United States’ growth rate is slower than many other countries, it still leads the world in number of Internet users over the age of 15. China, Japan, Germany, U.K., South Korea, France, India, Canada and Italy round out the top ten countries, ranked by number of unique Internet users. Brazil, Russia, India and China (BRIC) could have a larger GDP than the G6 (U.S., U.K., Italy, France, Germany and Japan) by 2040. This fact is part of a 25-page white paper from Goldman Sachs, “Dreaming with BRICs: The Path to 2050.” As the paper is fond of pointing out, if this indeed happens, “it will be a dramatically different world.” In the report, India is shown to have the greatest growth potential of the BRICs, followed by Brazil, China and Russia. A ranking of the most popular sites by country often shows the localized version of Google at the top of the list. Alexa has the rankings of the most popular sites by country, and the results are fascinating. In many instances, the localized version of Google is at the top of the list, giving some credence to the idea that preparing a localized version of your company’s Web site is a good way to start to penetrate that country’s market. In some countries, however, the number one site wouldn’t sound so familiar to the average consumer. China’s #1 site is Baidu.com . Russia’s #1 is http://mail.ru/. The number 1 site that is published in the Czech language is Seznam.cz. Sounds kind of like “shezam.” Anyway, along with finding out the top site in Czech, there is a list of the top sites in 20 other languages, including Turkish, Hebrew and Finnish (Google, Google and Google), on Alexa. Tags: Alexa, Brazil, BRIC, Canada, China, comScore, France, Germany, Globalization, Goldman Sachs, Google, India, Internet audience, Italy, Mexico, NBA.com, Russia, South Korea, U.K. This summer, my husband Chris and I took a vacation from our home north of Boston to Montreal. When we were preparing to go, I asked a number of people who had traveled there in the past if it would be a big deal that neither of us spoke French. They all told us that it would not be a problem, that everyone in Montreal speaks both French and English. They described the Canadian city as being “very European” but said it was accessible, that we wouldn’t have any trouble traveling there even with our complete lack of French-language comprehension. After hearing their reassurances, I admit that I didn’t think that Montreal was going to be much different than the United States. So I was surprised when we got to the city. The language wasn’t a barrier, exactly, but it was a differentiator. Although everyone I spoke to in Montreal did speak English, it was usually evident that they all would prefer to be speaking French. Every street name, sign, menu and all the directions that we came across were in French (although sometimes there was an English translation). And there were other subtle issues that made us feel like we were away – the food, the fashions, and the intangible but definite feel of the town that was so, well, different. For me, our experience in Montreal served to highlight how hard it is to “go global.” I don’t mean this in a technical sense, because it isn’t difficult to set up a Web site that will reach an international audience. What I’m referring to is the ability to create an experience on the Internet that feels local to an international audience. That is very difficult indeed. Certainly this isn’t a new challenge, and there are some companies that have been working on their international Internet strategies for years. 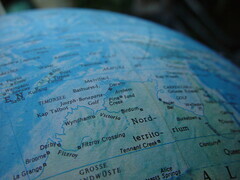 The Global by Design blog has a great analysis of the top 10 global sites. This list is comprised of both Internet companies (Google and Wikipedia) as well as more old-school technology companies (Cisco Systems and Phillips). Along with these leaders, there are a number of Web 2.0 companies that are beginning to effectively reach into global markets. Flickr, the community-based photo sharing site, offers eight language options along the footer of every page. The site also greets its users with a welcome in a different language every time they come (today my page says “Shalom 16thletter! Now you know how to greet people in Hebrew!”) in an effort to make the global community “feel” part of its users’ everyday experience. Myspace.com announced in late 2006 that it would be extending its site internationally, and they now offer international options as part of each users’ account settings to allow people to customize their local experience. And another example that I would offer up is Ikea. The Swedish furniture retailer is perhaps one of the most successful global sites today – the company’s home page features a list of countries from which to choose to customize my Web experience, and they do a good job when I arrive at the United States version of the Web site. But in a subtle way, perhaps because of that initial global landing page or maybe because of the slightly different design style that is the signature of the company and permeates the site, I am constantly reminded that this is not a U.S. company. This leads to the feeling that I am not “at home” on the site. It isn’t 100% comfortable and familiar. And this is the heart of the matter – what does it mean that I don’t feel at home on the site because it isn’t 100% comfortable? That feeling, that experience – it’s not quantifiable or measurable by any scientific methods or usability testing. And it is just this type of intangible that we have to get right in order to effectively “go global” on a local level. And it is also what makes the process so difficult. It might seem to be an oxymoron, but there is good BBQ to be found in Massachusetts. This photo was taken at Tennessee BBQ, where I dined this weekend – I recommend the ribs, they were delicious. But my favorite Massachusetts BBQ joint is at The American BBQ. Finding anything Internet-related about BBQing is slightly more difficult, but if you’re interested in cooking some ribs yourself, you’ll find a good list of resources about firing up the grill at About.com’s BBQ & Grilling section. I compiled this list from a variety of sources. I tried to double-check them all, but I want to throw out a disclaimer that some may not be reliable. The information that’s available about domain name sales can be sketchy because many times the people who are doing the buying and selling don’t want to reveal information about their transactions because it can hurt them in future bargaining. So to the best of my knowledge, this is the most up-to-date list of domain names that have sold for millions of dollars. There will be a point when domain name speculation as we know it will end. In its wake will remain a number of big guys – the folks like Kevin Ham and Frank Schilling who today own multi-million dollar domain portfolios and are growing their inventory daily. These guys and those like them have the money, development resources, years of experience and flexibility to adapt and change and bend with the changes of the search market and the Internet, so they will be the survivors. Right now, much of the money with domain name speculation is made by hosting a “parked” page on every domain in the inventory – the speculators then make money on all the traffic that goes to those pages through pay-per click (PPC) advertising. Some of that traffic is accidental, some of it because people utilized “direct navigation,” typing URLs directly into the search bar. But what happens down the road when the search engines get even smarter? What happens when Google and Yahoo are able to correct misspellings on the fly? Or when consumers get savvier and learn to not click on the ads that clutter the parked pages? What happens if Google discontinues its AdSense for domains program ? Or if a new search engine emerges that completely changes the way that search happens? What will the new world look like? New business models are already emerging, but most of what is “new” is based on the tried-and-true media/publishing model. Richard Rosenblatt is taking his vast network of domains and turning each of them into a Web 2.0 site with user-generated “how to” content. Ham’s company, Reinvent Technology, has a mission “to transform our direct navigation business into a cutting edge media company by leveraging new technology, innovative ideas, and intellectual capital.” In 2005, venture company Highland Capital Partners bought YesDirect, a holding company with 600,000 domain names. It has since launched turned that company into NameMedia, which features a product called Direct Search that turns domain names such as www.photography.com into an online community, employing an “editorial model” to create a “compelling user experience.” They also hired Kelly Conlin, former president and CEO of IDG – a media company.